PHNOM PENH (19 Feb 2019) – Vietnam scored the biggest win yet in this year’s AFF Under-22 LG Cup 2019 when they thumped Timor Leste 4-0 in the second game of Group A this evening that was played at the Olympic Stadium in Phnom Penh, Cambodia. The win ensured not only Vietnam’s place at the top of Group A for the moment where it also confirmed their spot in the semifinals of the championship where they will join Thailand. It has also set up an exciting finale in the group in two days where Vietnam will take on Thailand to decide the group winner before the crossover semifinals. The odds were always stacked against Timor Leste to pull off the win especially when they were playing under pressure following their loss in their first game of the group. But the Timorese took the match gamely against a well organised Vietnamese side determined to show an improvement from their first showing. 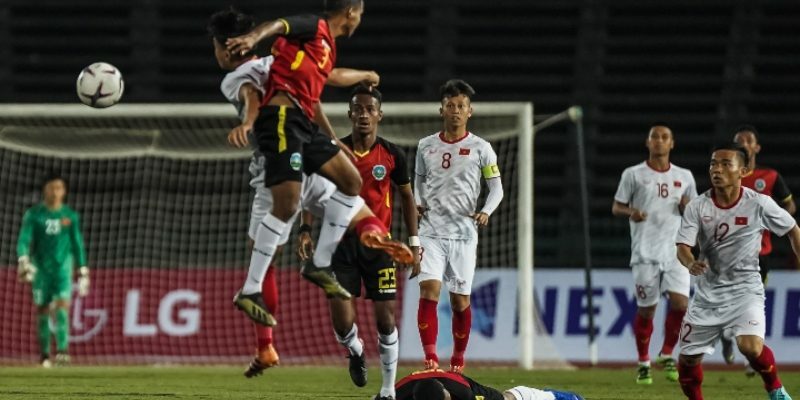 A defensive lapse in the first half almost allowed Timor to score but that failure gave Vietnam the chance to pour forward and in the 40th minute, they grabbed the lead when striker Tran Danh Trung capitalised on a miscommunication in the opponent’s backline to put the ball away. That goal seemed to have affected Timor somewhat and in the 62nd minute, Danh Trung was on target again as he broke down the left before cutting in to blast past Aderito Fernandes for the second time. Aderito’s goal was breached again in the 82nd minute with Phan Thanh Hau picking up a pass from deep to score. And with just seconds remaining in the game, substitute Le Xuan Tu completed Vietnam’s win with a header after Nguyen Huu Thang’s earlier attempt was blocked. “There are many areas which we need to improve. The players just lost focus after that first goal. They need to work on the mental strength especially,” added Timor Leste head coach Norio Tsukitate.